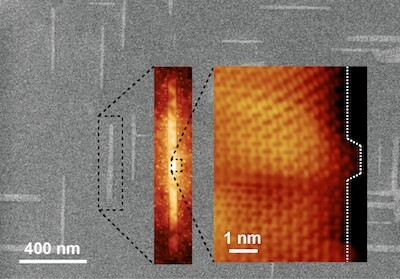 Growing graphene nanoribbons; solid-state electrolytes in batteries. University of Wisconsin-Madison engineers discovered a way to grow graphene nanoribbons with desirable semiconducting properties directly on a conventional germanium semiconductor wafer. This could allow manufacturers to easily use graphene nanoribbons in hybrid integrated circuits, which promise to significantly boost the performance of next-generation electronic devices. The technology could also have specific uses in industrial and military applications, such as sensors that detect specific chemical and biological species and photonic devices that manipulate light. Another strategy for making nanoribbons is to use a “bottom-up” approach such as surface-assisted organic synthesis, where molecular precursors react on a surface to polymerize nanoribbons. Surface-assisted synthesis can produce beautiful nanoribbons with precise, smooth edges, but this method only works on metal substrates and the resulting nanoribbons are far too short for use in electronics. To overcome these hurdles, the researchers developed a bottom-up technique in which they grow ultra-narrow nanoribbons with smooth, straight edges directly on germanium wafers using chemical vapor deposition. In this process, the researchers start with methane, which adsorbs to the germanium surface and decomposes to form various hydrocarbons. These hydrocarbons react with each other on the surface, where they form graphene. The team made its breakthrough when it explored dramatically slowing the growth rate of the graphene crystals by decreasing the amount of methane in the chemical vapor deposition chamber. They found that at a very slow growth rate, the graphene crystals naturally grow into long nanoribbons on a specific crystal facet of germanium. By controlling the growth rate and growth time, the researchers could tune the nanoribbon width be to less than 10 nanometers. The nanoribbons produced with this technique start growing at seemingly random spots on the germanium and are oriented in two different directions on the surface. The team’s future work will include controlling where the ribbons start growing and aligning them all in the same direction. Researchers at MIT and Samsung developed a new approach to one of the three basic components of batteries, the electrolyte. The new findings are based on the idea that a solid electrolyte, rather than the liquid used in today’s most common rechargeables, could greatly improve both device lifetime and safety while providing a significant boost in the amount of power stored in a given space. The key to making this feasible was finding solid materials that could conduct ions fast enough to be useful in a battery. The research team analyzed the factors that make for efficient ion conduction in solids, and home in on compounds that showed the right characteristics. The initial findings focused on a class of materials known as superionic lithium-ion conductors, which are compounds of lithium, germanium, phosphorus, and sulfur, but the principles derived from this research could lead to even more effective materials, the team says. This solid-state electrolyte has other, unexpected side benefits. While conventional lithium-ion batteries do not perform well in extreme cold and need to be preheated at temperatures below roughly minus 20 degrees Fahrenheit, the solid-electrolyte versions can still function at those frigid temperatures. The solid-state electrolyte also allows for greater power density. Such batteries could provide a 20% to 30% improvement in power density.